The number of foreign language speakers in the United States has increased an impressive 90% since 1990. There are 38.4 million Spanish speakers reported in the US. The next most common language is Chinese, with 3 million speakers, followed by 1.6 million Tagalog speakers, 1.4 million Vietnamese speakers and 1.3 million French speakers. These populations translate into a new challenge for healthcare professionals and organizations across the nation. Nearly everyone in the healthcare sector agrees that communication is paramount to providing quality healthcare services. In a Robert Wood Johnson Foundation’s survey, 94% of healthcare providers surveyed cited communication as a top priority in delivering quality care. This growing percentage of the patient population with limited English language skills face a barrier to receiving that high-quality care – specifically, a language barrier. In that same survey, 70% of healthcare providers stated that a language barrier can compromise a patient’s treatment. Patients that have difficulty explaining their symptoms or understanding their disease or treatment needs, are in risk of complications. 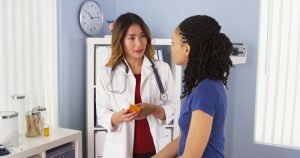 Patients with limited English proficiency might not be able to discuss important lifestyle modifications that will benefit their conditions; or the might lack the ability to understand a healthcare provider’s treatment advice, meaning they could be missing out on essential aspects of their own care. So how do modern day healthcare providers adapt to the changing population in order to continue to provide top-notch care for their patients? The first thing a healthcare provider needs to do in order to better serve their foreign language population is to survey their staff members to see who already has bilingual or multilingual capacities, and to what degree. It’s increasingly more common in the U.S. today for the children of immigrants to grow up perfectly bilingual, and it’s likely you already have one of these first-generation American and heritage speakers working in your organization. Certified bilingual staff ensures that patients with limited English language abilities feel supported and receive appropriate care for their situation. “It’s critical that patients can feel heard and understood in a medical environment, and make sure that they’re getting the care that they need, ” explained a representative from Mosaic Medical, a central Oregon community medical center that focuses on translation services as a pillar to providing quality health care. Having certified bilingual staff, interpreters or speakers of another language increases the ability to coordinate care, reduces the potential for error and improves patient trust – both in their services provided, and in the organization as a whole. The quality of the interpreter in medical situations, however, is absolutely critical to a successful program. When interviewing potential translators, it is important to include valid and reliable language assessments from a trusted partner to ensure that candidates truly have the ability to deliver the services needed, should they be onboarded, as translation mistakes in a healthcare setting carry a higher risk than in other fields. That means healthcare providers need to employ high-quality language tests during the hiring process, to ensure that language proficiency is assessed accurately and reliably. Too often language skills are over, or surprisingly, underestimated on resumes, which might lead to choosing the wrong candidate for a certain position. Language testing during hiring means avoiding those potentially costly errors and ensuring that the employee hired is capable of successfully fulfilling their job requirements. If communication services are essential to providing quality care for growing foreign language populations in your area, then it’s a good idea to consider long-term solutions as well as immediate ones. While providers may never become fluent, and may always need a translator’s aid, having the ability to connect in a patient’s mother tongue can increase a level of trust between patient and provider, improving the patient’s overall experience with the provider and ultimately, with the organization. When the patient both trusts and completely understands the diagnostic and treatment requirements given by the healthcare provider, there is a higher success rate with that patient’s care. They’re more likely to comply with lifestyle modifications, properly take prescribed medicines and return for follow up appointments. Quality communication in a healthcare environment also improves referral rates both for the provider and the organization. Most importantly, having bilingual professionals in a healthcare environment ensures that your patients are getting the best care possible.